After the state of Louisiana announced that more than 10,000 families applied for vouchers in an effort to choose a better school for their children, the Louisiana Association of Educators threatened to sue any private schools who participate in the voucher program. And now, they and another union are challenging the constitutionality of the program in court. Beginning on November 28th, the trial will examine the voucher program and determine whether it can be upheld for the thousands of families who are depending on it. 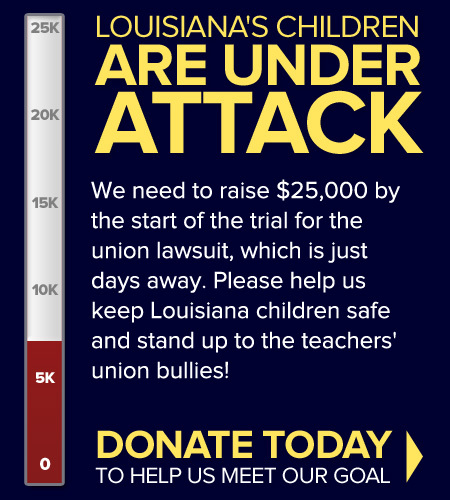 These unions are desperate to maintain their power and will stop at nothing to keep children trapped in failing Louisiana schools. The Alliance for School Choice won't stand for this. But to ensure that children's educational opportunities aren't destroyed, we need your help. So please, stand with us against these special interests by contributing to our cause today. Together, we'll make sure that political manipulation never gets in the way of a quality education.